"I won’t leave for a job site without my Dura-Grader"
The SSF (Skid Steer Fixed) Series Dura-Grader is specifically designed to work with skid steers of all major brands and features blade holders welded into a fixed position. It easily attaches to your skid steer or front load tractors with our universal quick attach plate. The patented opposed 4 blade design makes pushing or pulling the grader effortless. 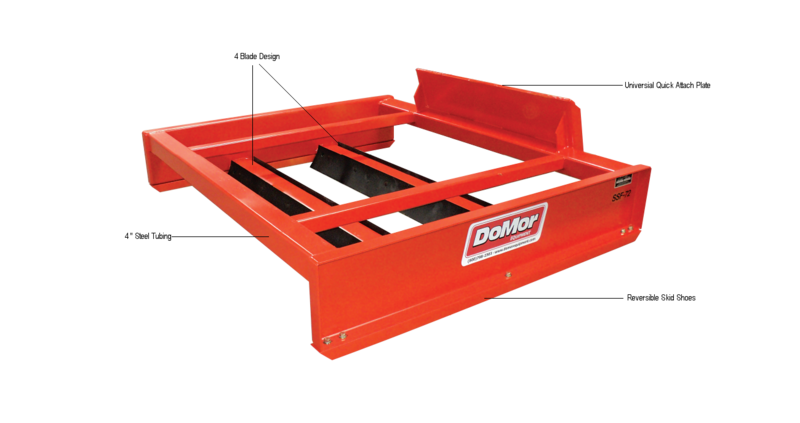 The skid steer graders from DoMor Equipment are heavier built and more effective than other land planes. It is the ideal grader for construction sites, landscaping, farms or ranches, and road maintenance and can also be used to knock down small trees and clear brush. SSF-72 980 lbs. 50 HP. 79 in. 22 in. 69 in. 6ft. SSF-84 1,110 lbs. 60 HP. 91 in. 22 in. 69 in. 7ft. SSF-96 1,250 lbs. 75 HP. 103 in. 22 in. 69 in. 8ft.